Japan is famous for its high cost of living. However, pre-wedding photos can be surprisingly affordable. Whether you're looking to spend a few hundred dollars, or a few thousand, there are plenty of options available. In some countries, freelance photographers charge an hourly rate for their work. 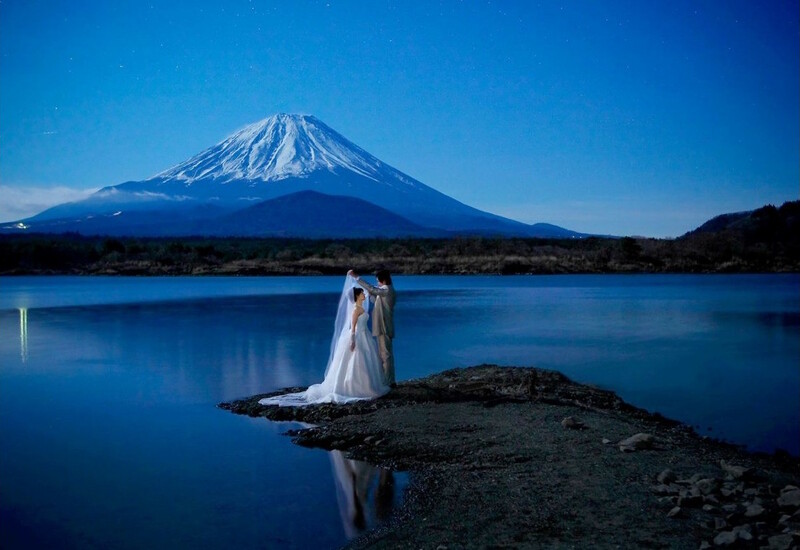 However, in Japan, the majority of photographers offer fixed rate pre wedding photo packages. There are many factors which affect the price of a package. For example, the length of the photo shoot, number of photos to be delivered, rental attire or makeup services, transportation, and finally the photographer themselves. We've found that, depending on your requirements, prices fall roughly into the four categories below. Have limited time or budget for your pre-wedding photos? Not a problem! There are plenty of photographers in Japan who offer photo shoot services under $500 (about 50,000 YEN). Depending on the area the photographer's transportation fee may also be included. For these type of packages the clients must prepare their own outfits and makeup. The shooting time is usually 1 or 2 hours and you will receive 30 - 100 photos which suits couples in need of a basic photo shoot. 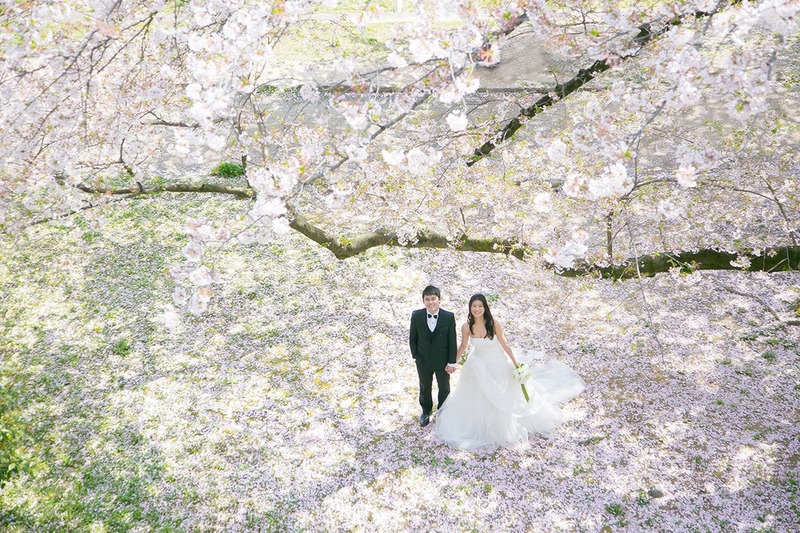 Photo shoot plans in this budget (between 50,000 YEN to 100,000 YEN) give couples more flexibility when choosing their pre-wedding photographer. The shooting time will be between 2 - 3 hours and you can expect to receive 150 - 300 edited photos. Many packages in this price range include hair styling and makeup. Some even include rental wedding dresses, tuxedos, and accessories. This leaves you with hardly any preparation to do before the shoot and is perfect for busy couples. If you have been dreaming of wearing a gorgeous traditional Japanese wedding kimono, your photo shoot will be somewhere in this price range. Wedding kimono are expensive to rent for a number of reasons and it is not unusual for them to add an additional 60,000 YEN ($600) to the price of a regular photo shoot. Photo packages in this range usually include hair styling and makeup, and can also offer western-style wedding attire. Depending on the photographer you may receive a photo album. These photo shoots vary in length but packages at the upper end of the tier can go for 3 - 6 hours as you change clothes or visit several locations. Expect to receive 300 - 500 photos depending on the length of the shoot. This is for couples who want it all! Packages in this price range (and beyond) can provide you with an all-day photo shoot travelling to different locations in a private vehicle, both a kimono and wedding dress, hair stylist, make-up, and an assistant to keep you looking fabulous. Having the entire day means you can spend plenty of time on your poses and composition, achieving stunning cinematic shots. An all-day package is usually 8 hours and you can expect over 500 photos, depending on the complexity of the shoot. Overall, no matter how much money you are planning to spend on your pre-wedding photos, there is a package for you. Please don't hesitate to contact us for recommendations or a custom quote.